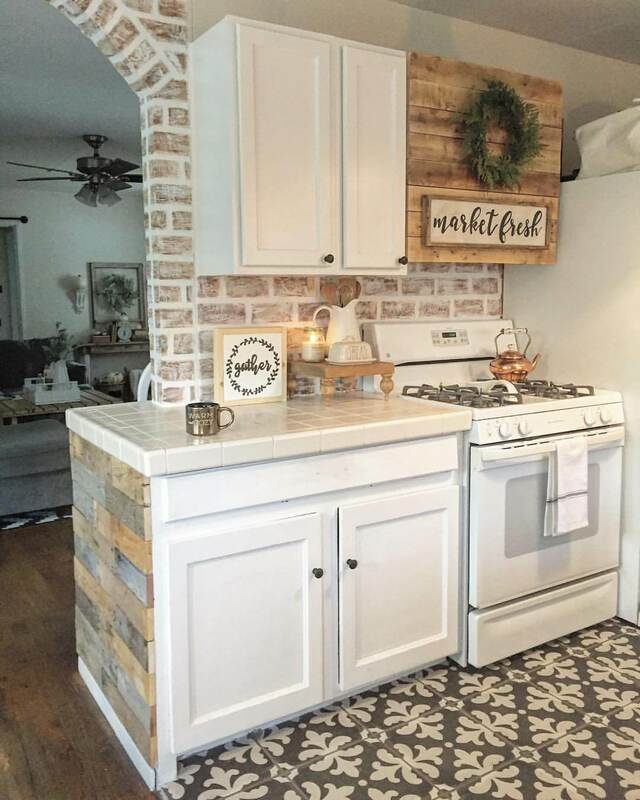 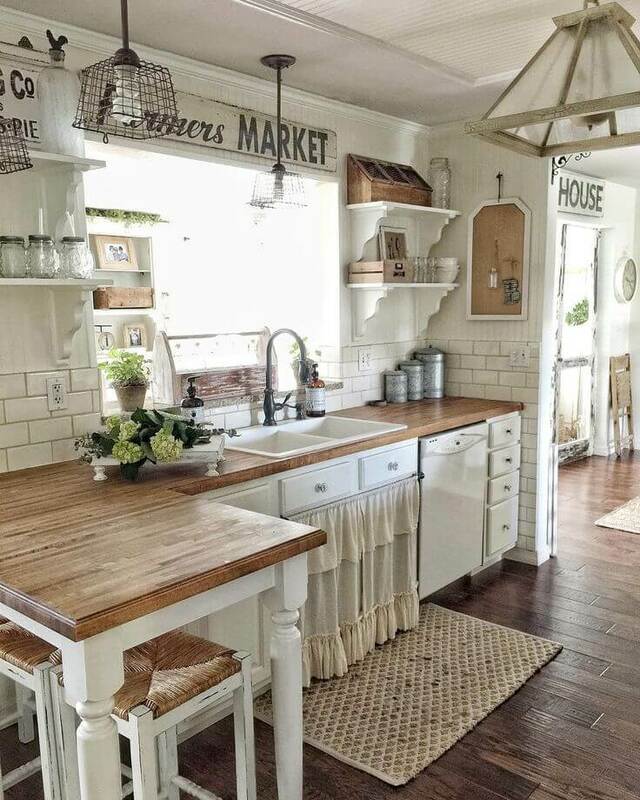 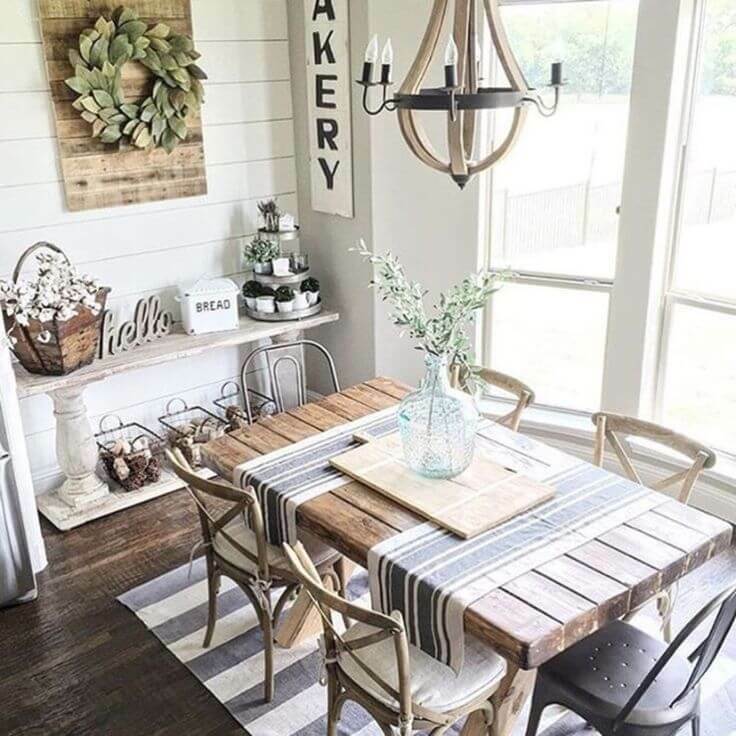 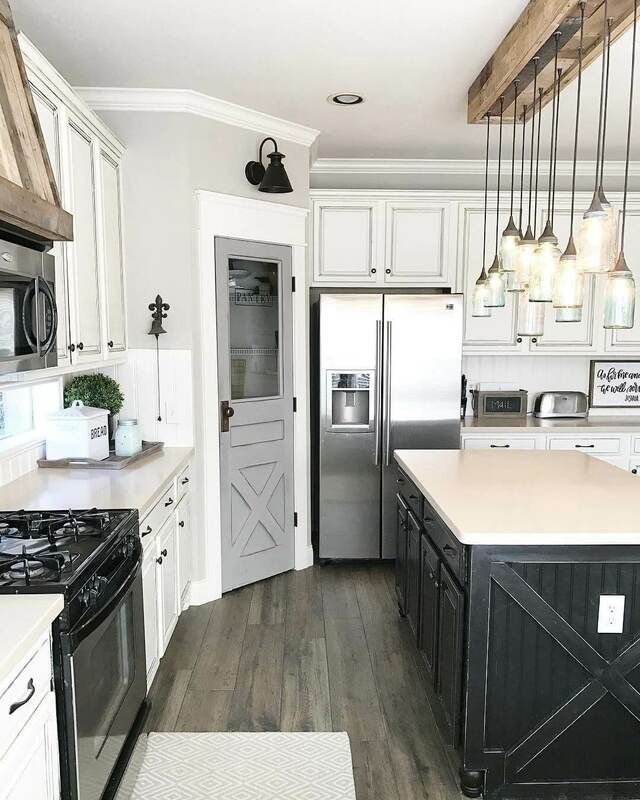 In other words, the potential of the farmhouse look is only limited to your own imagination, tastes, and budget. 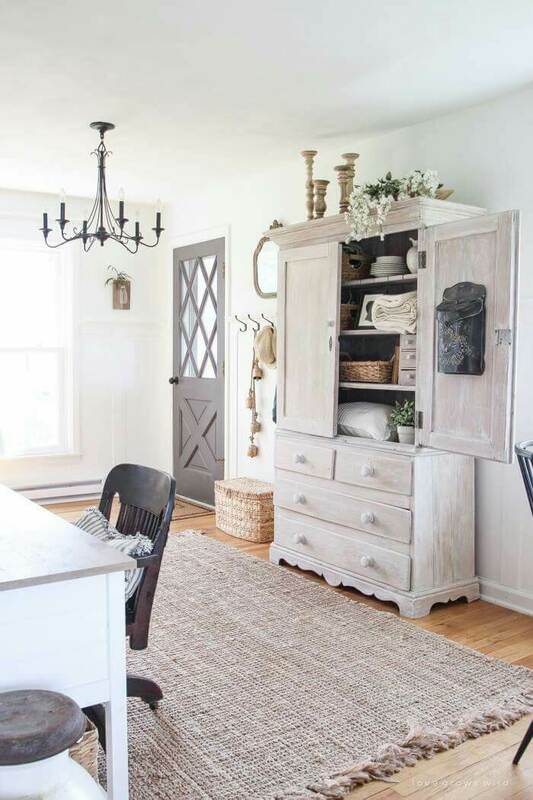 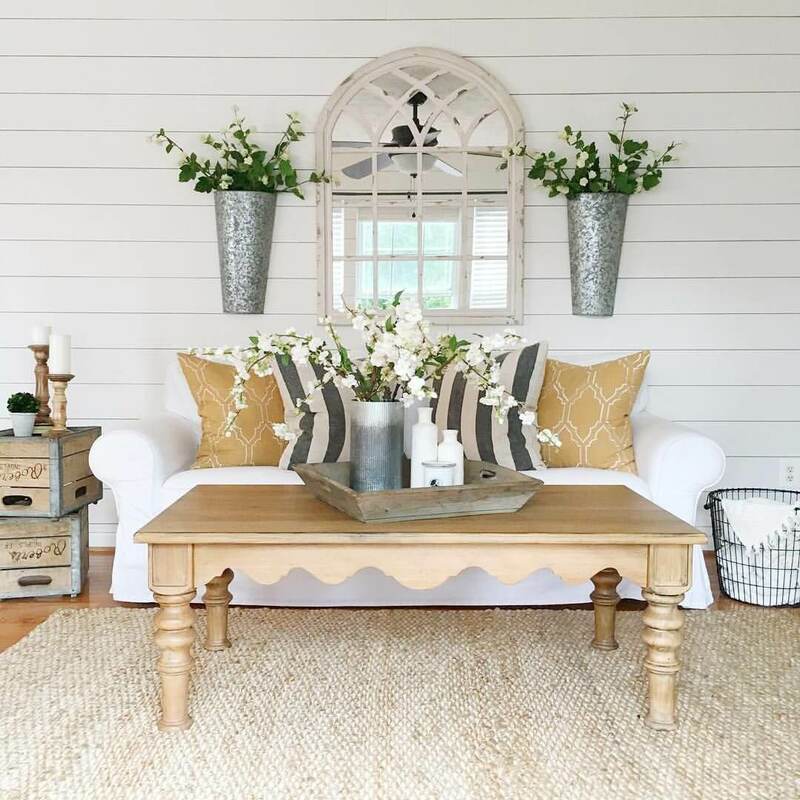 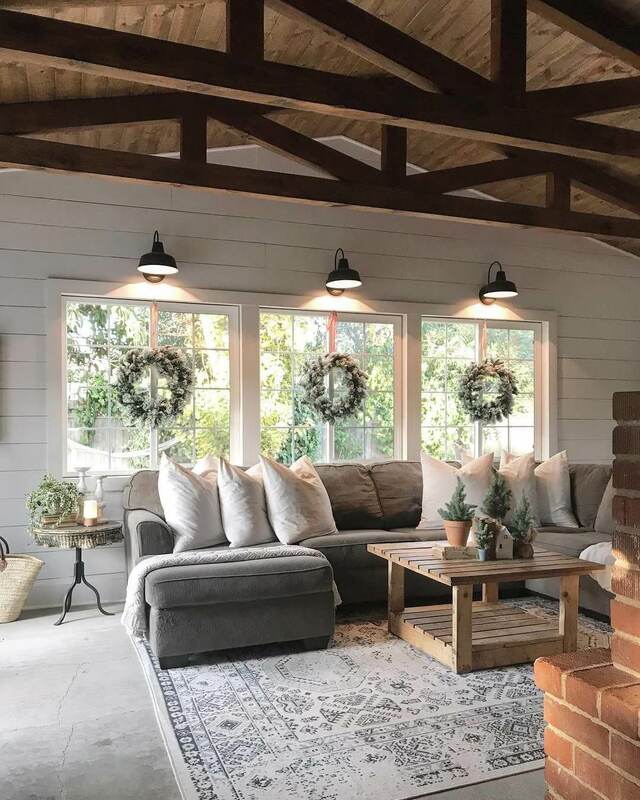 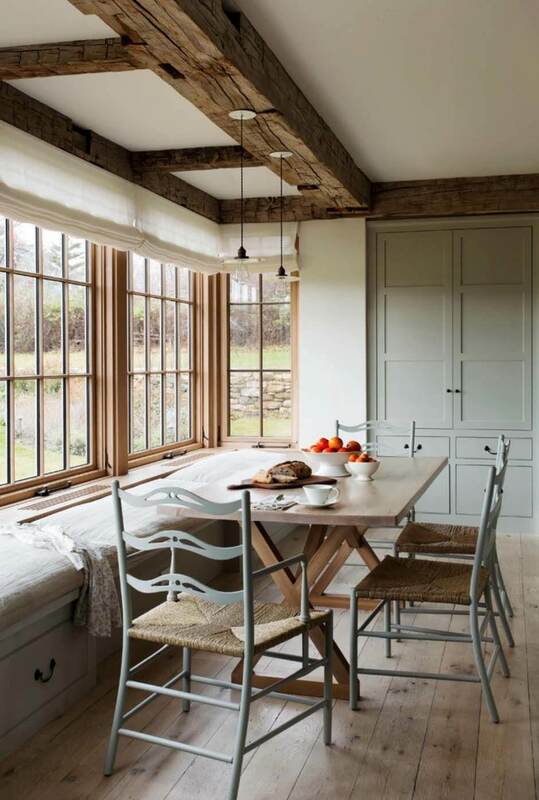 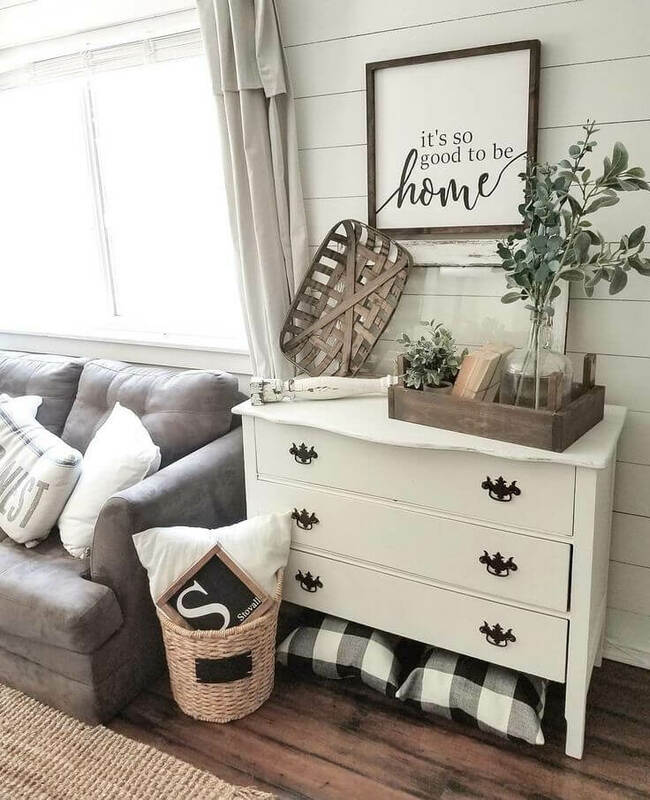 Broaden your understanding of farmhouse design concepts with our curated gallery of over three dozen awesome floor-to-ceiling farmhouse interiors. 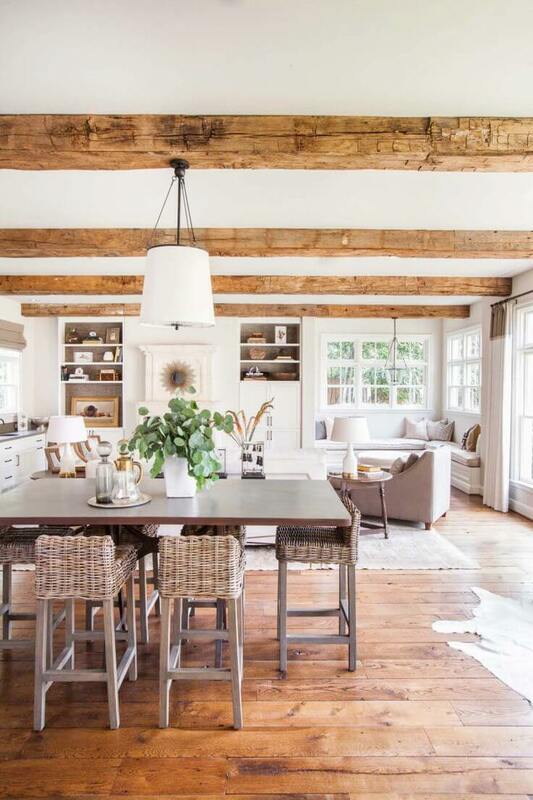 We’ll help you bring the warmth of this time-tested trend into every room of your house. 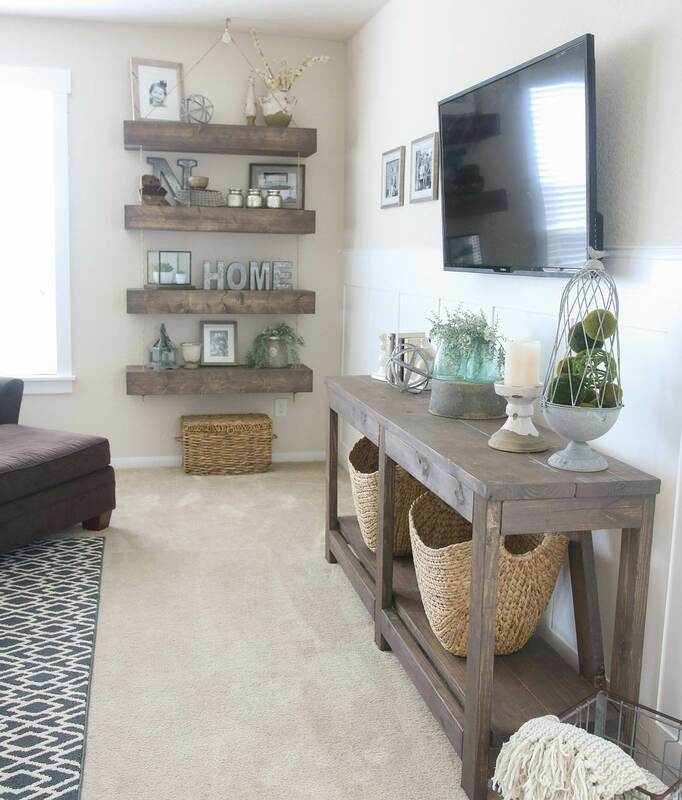 An inviting living room includes a plush couch with oversized cushions and a soft gray throw. 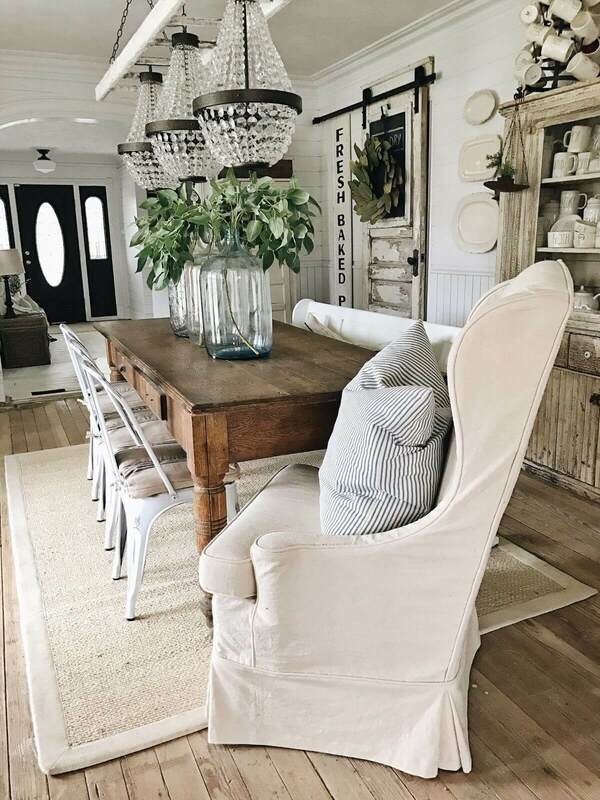 An old fashioned coffee table with turned legs and two classic armchairs sit alongside. 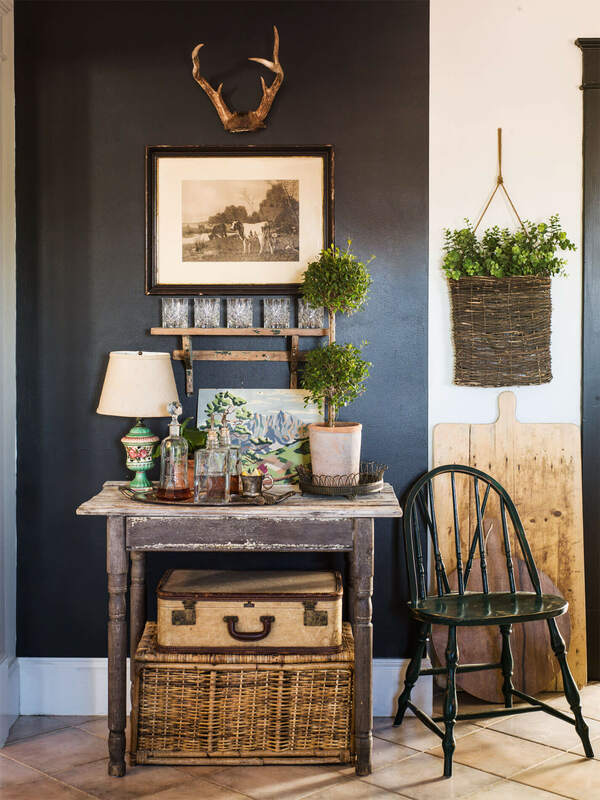 A floral arrangement in an old crock and three vintage books sit on top. 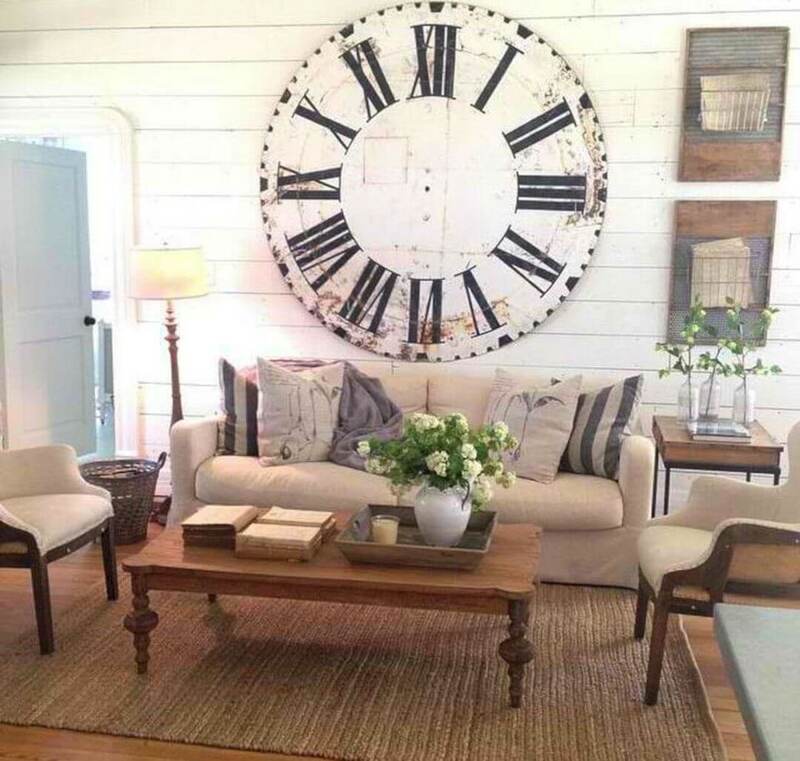 The focal point of the room is a huge painted clock face in vintage style. 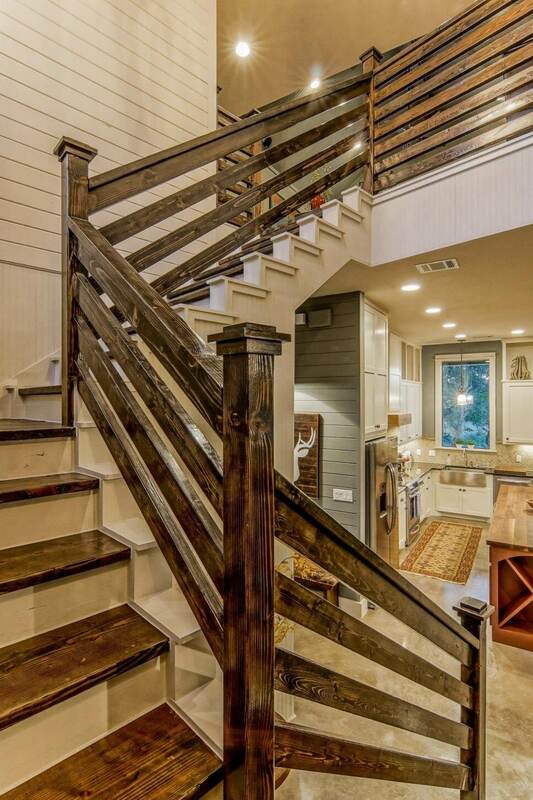 This stair area updates farmhouse look with a Mission style white railing. 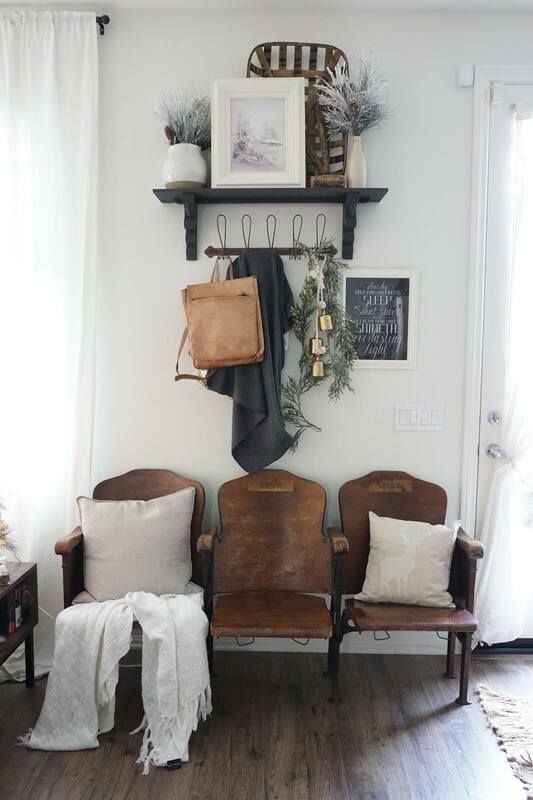 On a ledge above the stairs sit family photos in oversized black and white frames. 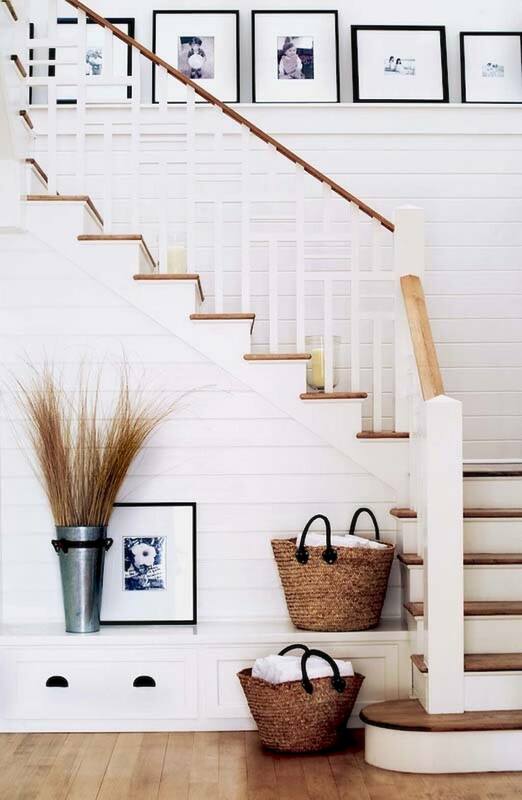 At the foot of the stairs there is a storage bench with a dried grass arrangement in a tall galvanized pail. 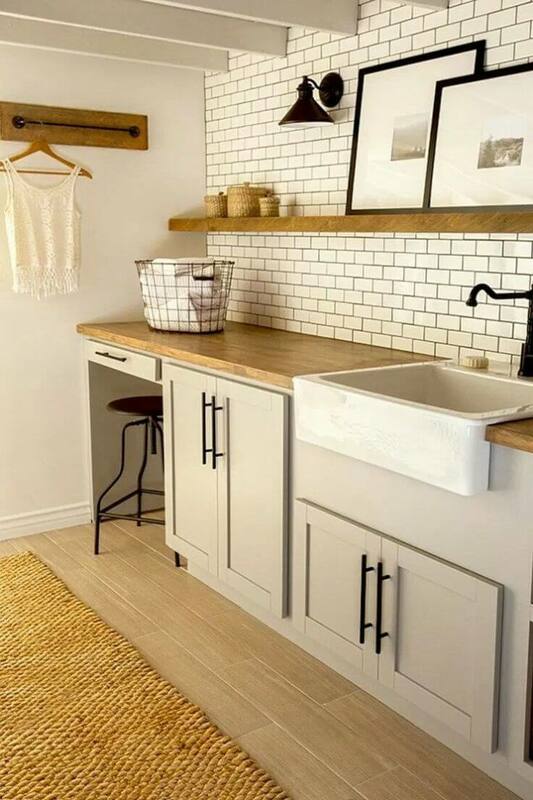 Two utilitarian baskets sit on the ledge and on the floor. 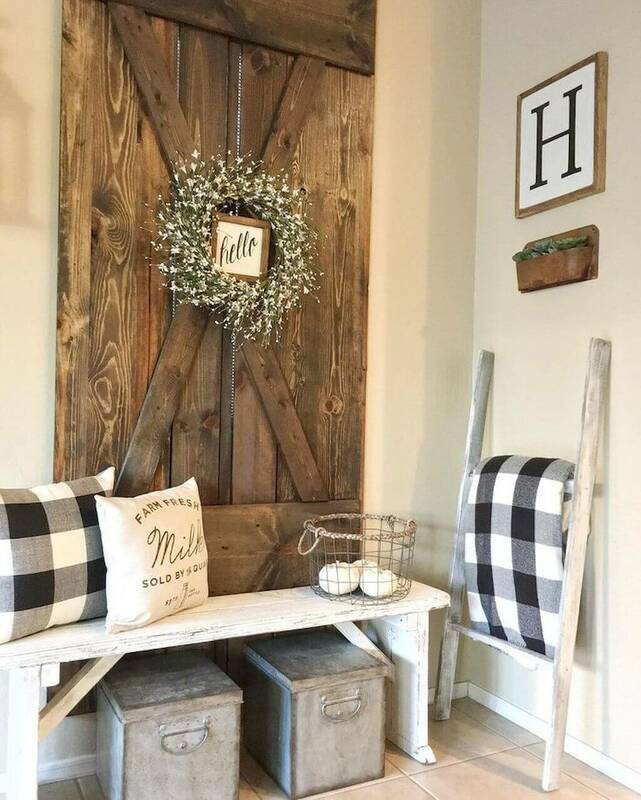 A barn door panel is hung on the wall. 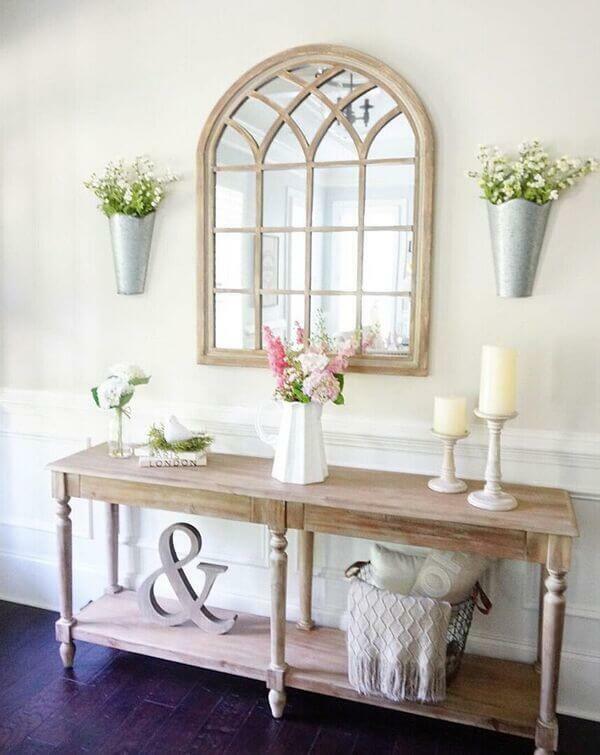 A pretty white floral wreath hangs on the door, accented with a small lettered sign welcoming guests to the home. 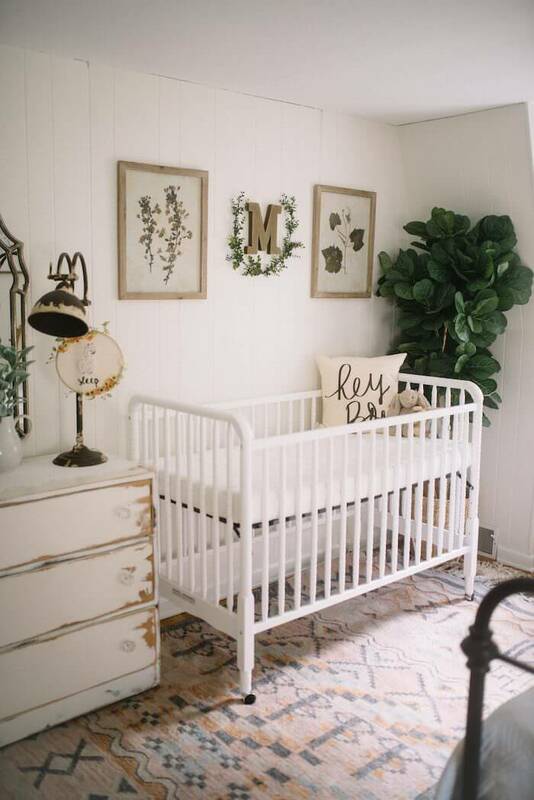 On the wall, the family’s initial takes pride of place. 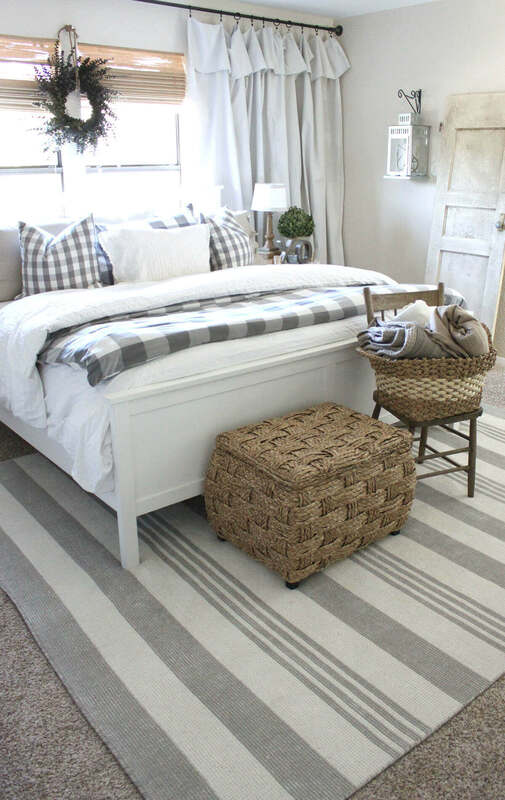 A buffalo plaid blanket and cushion decorate the space, along with a printed pillow. 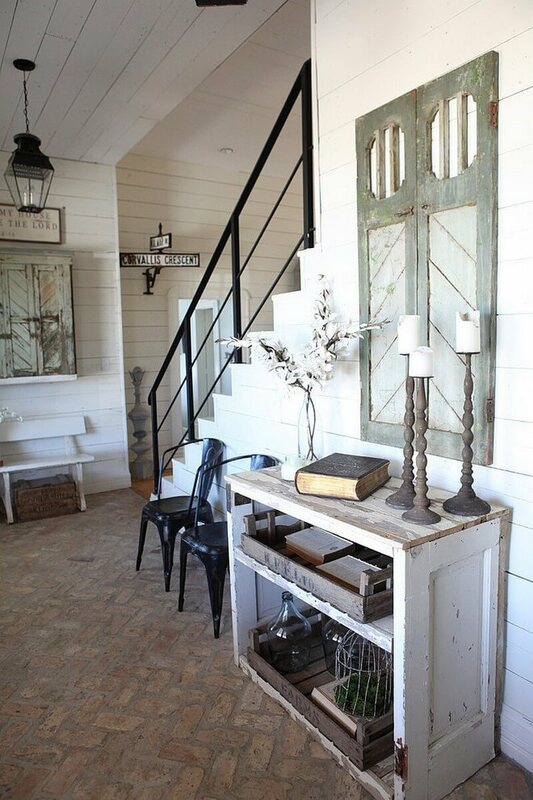 Two galvanized boxes sit under the bench. 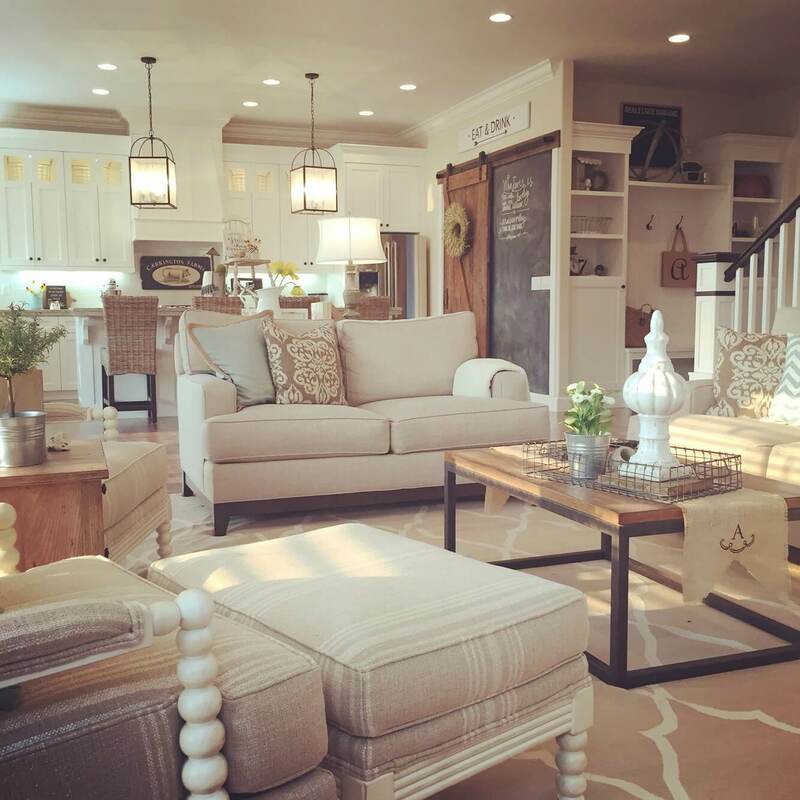 This open floor plan area combines the dining area and the living room. 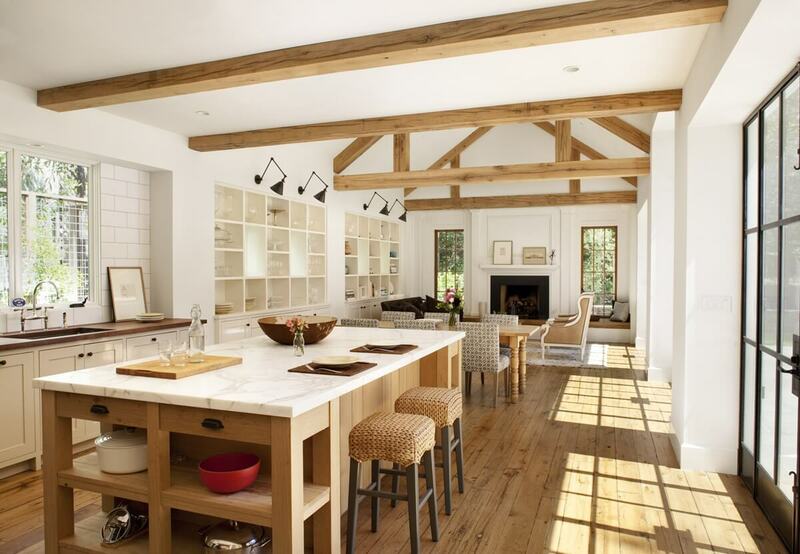 The exposed beams on the ceiling complement the wide wooden floor planks. 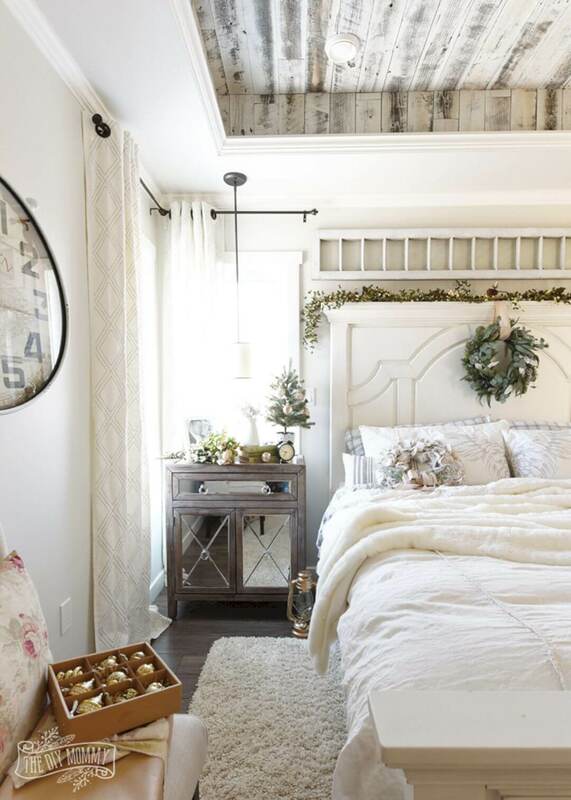 The white walls make the room feel larger. 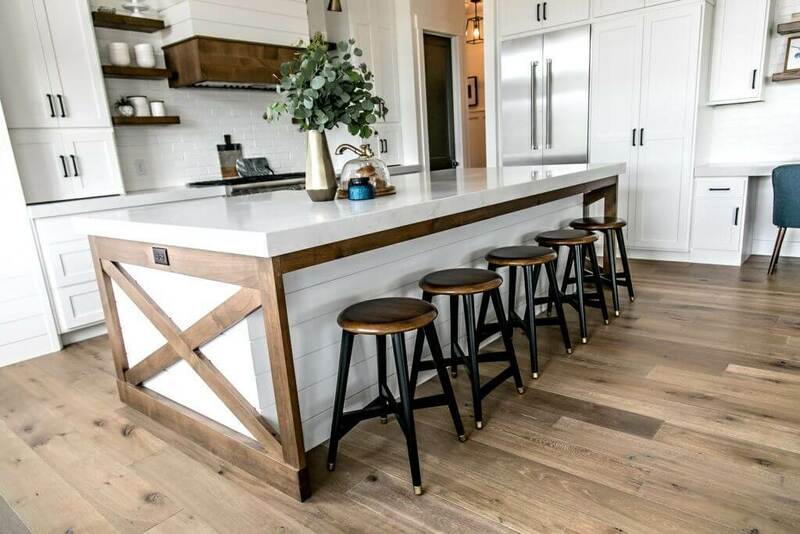 The bar height kitchen table has stools with woven wicker seating surfaces. 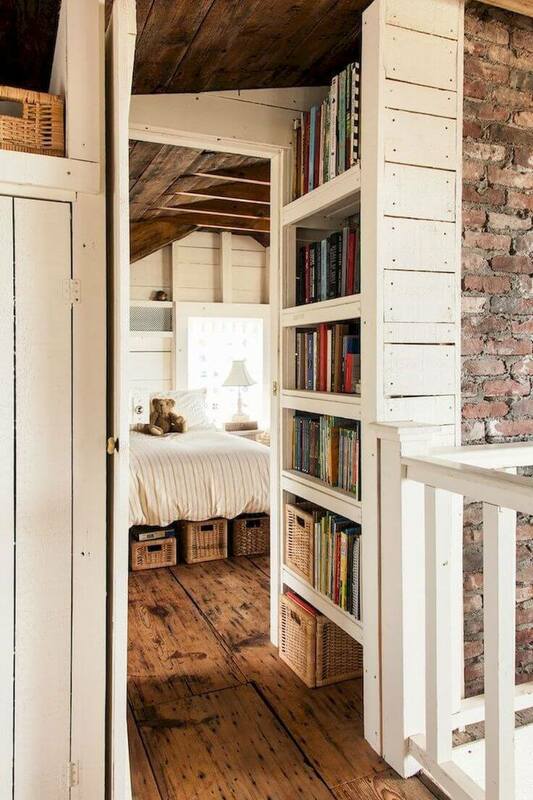 Built in benches and bookshelves give a practical touch. 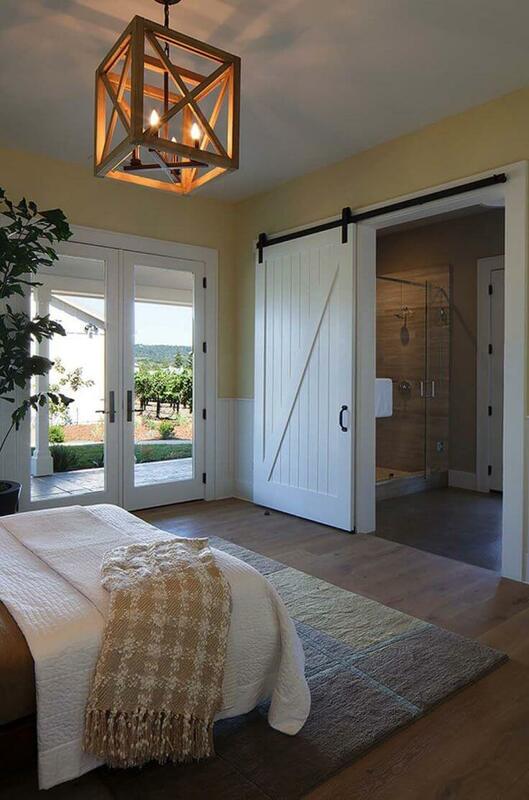 This double sided barn door slides to open. 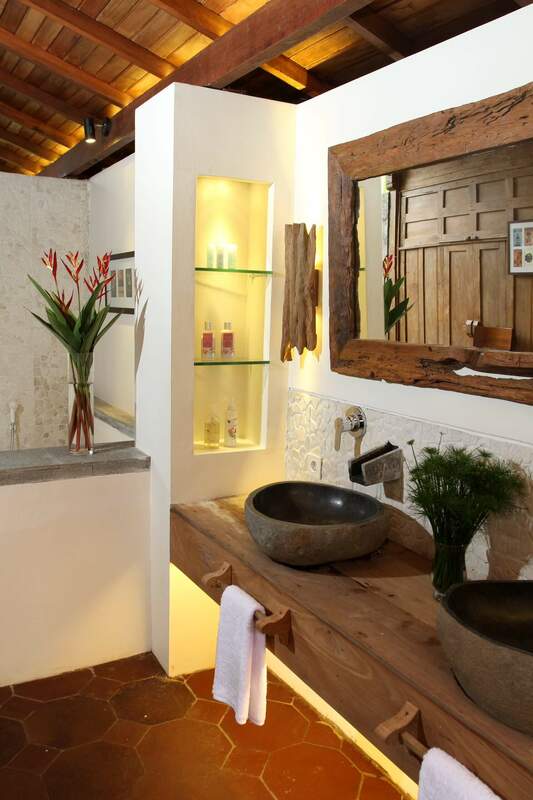 It brings rustic style to the gracious blue and white room with its four-poster bed. 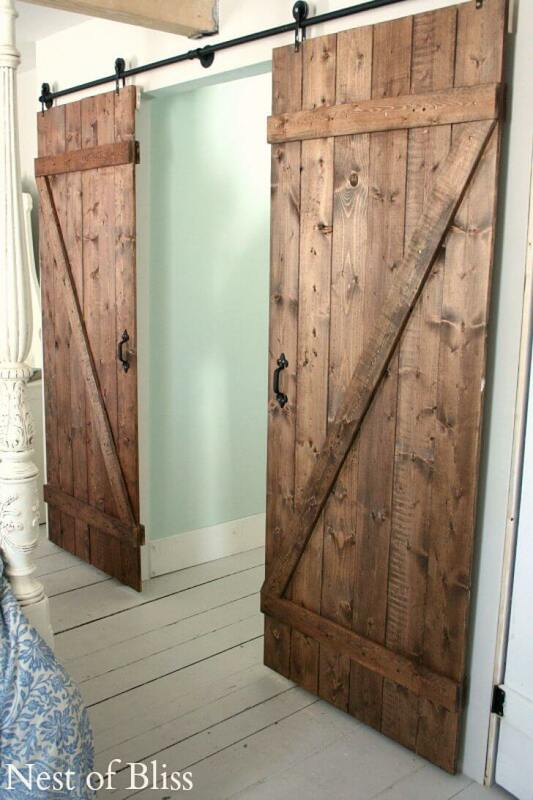 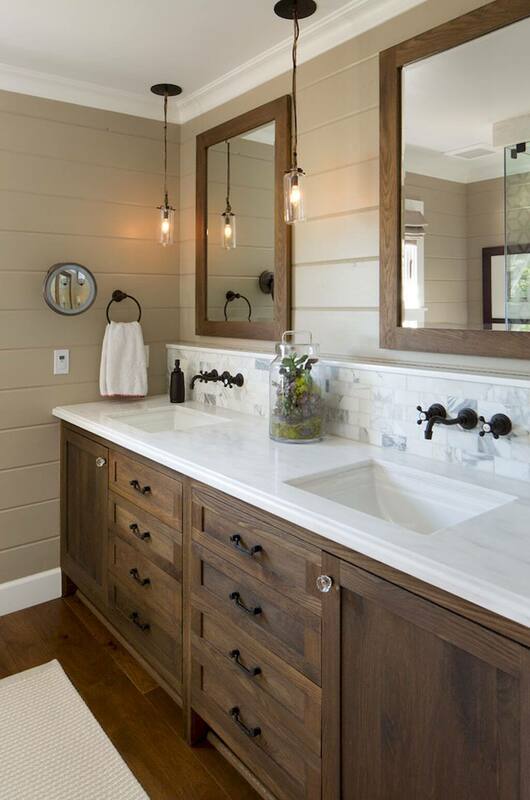 The exposed hardware for the barn door accents the wall. 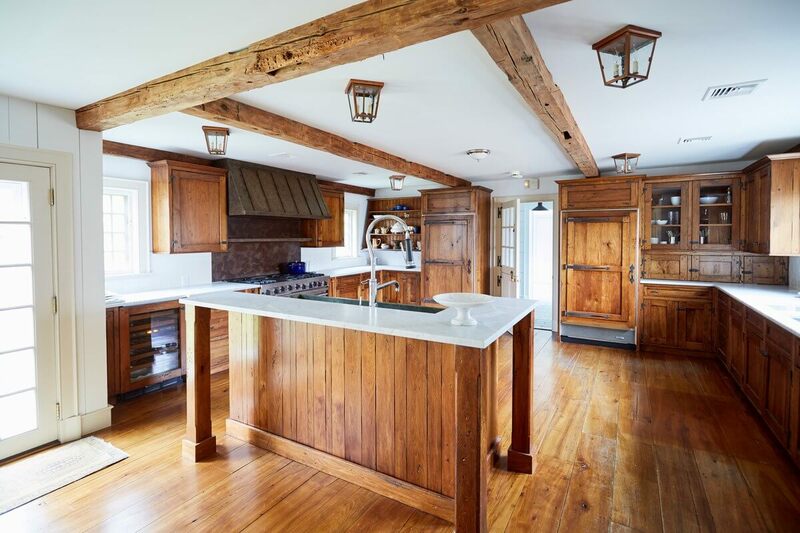 Exposed beams in the room add to the barn aesthetic.